When governance, a support structure, guidance, measurements and shared learning exists across an organization, success is far more likely. Success supports organizational and specific projects goals. A need to gain results should be the primary motivation for creating a center of excellence and serves as the foundation for its creation. Our own experience bears this out. We recommend and assist in developing CoEs to support various objectives. These CoEs increase the long-term effectiveness of an ongoing program. Because few organizations are able to support a fully functioning CoE at the start of a lean, six sigma, agile, BPM or other improvement program, we recommend starting by deploying a steering committee and getting help with training and mentoring to grow it through a maturity cycle into a full-fledged, effective CoE. A Center of Excellence (CoE) consists of a team of people that promote collaboration and using best practices around a specific focus area to drive business or customer-valued results. Team: No one person can possess all the skills necessary nor fill all the roles required for a CoE. It will take multiple dedicated people to deliver results. This does not mean that they need to work full-time in the CoE, but all team members must be fully dedicated to success. Collaboration: Value comes from sharing knowledge, skills, experiences and ownership both inside and outside the CoE. Working well in and across team and organization structure is essential. Best Practices: These take the form of methods, tools, templates, approaches and ideas that have shown to have beneficial application across multiple customers, needs, issues and projects. Focus Area: The area cannot be too narrow nor too broad. It must be just sufficient to meet a specific, long-term, priority business objective. Example focus areas may be process, product development, six sigma, cardiology, program management, strategy, risk, or other technologies, skills, methods, or areas of study. Results: A CoE is not a library to create and store knowledge. It can only justify its existence if can deliver value significantly greater than the costs of staffing and running it. Ego: Leave it at the door. Success is shared and celebrated among all participants. A humble willingness to learn, adapt and improve while helping others grow is necessary at all times. 1. Governance: Allocating limited resources (money, people, etc.) across all their possible use is an important function of CoEs. They should ensure organizations invest in the most valuable projects and create economies of scale for their service offering. 2. Support: For their area of focus, CoE’s should offer support to their customers. This may be through services needed, project work or providing subject matter experts. Other resources like share facilities for working together and specialty equipment may also be part of the offering. 3. Guidance: Standards, methodologies, templates and knowledge repositories are typical approaches to filling this need. 4. Shared Learning: Training and certifications, skill assessments, team building and formalized roles are all ways to encourage shared learning. 5. Measurements: CoEs should be able to demonstrate they are delivering the valued results that justified their creation through the use of output metrics. · Specialty Skill Practitioners: CoE’s staff, build and borrow resources with deep specialty skills as needed from across and outside the organization. The mix depends on the specific vertical and the current priorities and objectives being deployed. · Analysts: At the core of a CoE are strong analytic problem solvers that understand how to apply skills across a variety of situations to get the best results. This can include traditional business analysts as well as process improvement specialists with skills in six sigma, lean, and agile concepts. · Managers: Project, program and change managers stitch together the complex dependencies that ensure readiness for working differently. · Leadership: Supporting a CoE are visionaries moderated by an enterprise prioritization and resource allocation process. These visionaries focus on expanding use of the competencies and challenging others to improve existing and explore new opportunities and relationships to keep the business relevant for an ever changing world. Initial (chaotic, informal, ad hoc, heroic) the starting point for use of a new process. Repeatable (managed, documented, process discipline) the process is used repeatedly. Defined (institutionalized, integrated) the process is defined/confirmed as a standard business process. Managed (strategic, quantified) best practices are shared and process management and measurement takes place. Optimized (continuous improvement) includes deliberate and continuous process optimization/improvement. The Initial stage usually exists before organizations begin to recognize the need for CoE’s. Capabilities may initially live in functional organizations or with individuals. In the earliest stages, establish a steering committee or create initial pilot projects to begin to identify and focus skills in an organization. Organizations begin to move to a Repeatable stage when they start viewing CoEs as an asset to project teams. With this project centric view, they know that teams need support and are looking for a home for the deeper skills they require. Identify leaders for the CoE and other resources with the skills needed for the roles given above. CoE leadership begins to coordinate across projects, train and mentor others, help plan and set scope, and monitor the capabilities they were responsible for building. To move to the Defined stage, they begin to define and document the standards and practices for their competency. By this stage, a team charter should define the center. Team members should capture best practices in a wiki or similar format and began to more actively manage associated risk and quality. Training and reference best practices should be standardized and help to actively communicate the competencies across the organization. Making the leap to the next higher level requires strong coordination and, therefore, strong commitment across executive levels. CoE sponsors and leaders should coach executive leadership so that Organizations can gain this commitment to begin to build Managed, strategic CoEs. The focus becomes across an organization with clear support for corporate plans, integrated with corporate score cards, and an actively managed portfolio of initiatives that use their service. The true power of CoE’s begins to be unleashed as more formal career paths are created and development and mentoring become available for the competencies the CoE supports. Optomized CoE’s continue to build increased corporate value. At this level, the CoE is an asset that is recognized across the organization. They feel ownership for corporate goals and ensure success of projects supporting those goals. Assessments ensure consistent application and improvement of the competencies needed to meet the goals. They take responsibility for the corporate score cards and their associated value. Audits, skill assessments and certifications further improve capabilities. A well functioning, optimized CoE will improve existing business practices and help grow new capabilities within an organization to maximize value to a changing enterprise. Love this post and topic, Jon. 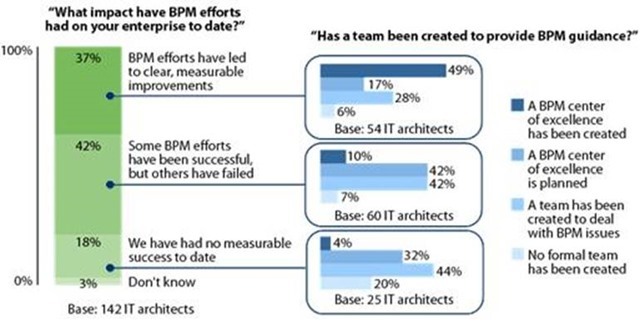 It would be great to explore the leanest possible COE implementation and activities model for a small company and/or a company that tends to stay away from formal structures like COE, PMO, etc., but still practices BPM.